Part #2 of the Historic Burge Estate Auction. Being sold on behalf of the Trust. This multi-generational estate of 2 prominent Macon and Atlanta families is full of quality Antiques, Jewelry, Asian Antiques, Furs, Antique Books, Art, Silver, Crystal, China, Silver, Collectibles and so much more. Everything has been moved to our location, 2381 John Glenn Drive 108, Atlanta. You can inspect the items Sunday, April 22 and Thursday, April 26 during the hours of 11:00 A.M. to 2:00 P.M. 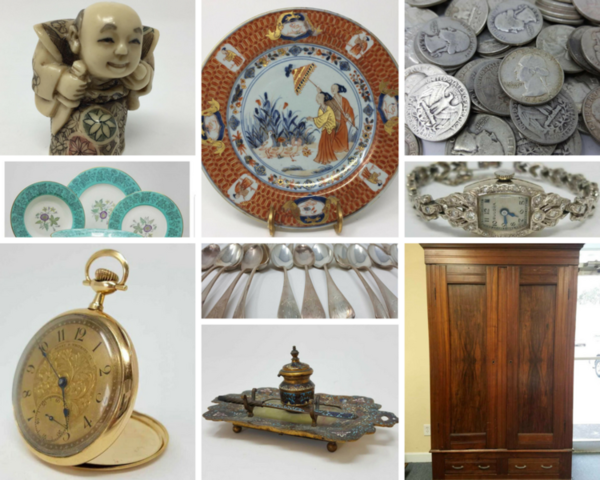 The auction is online bidding only and is now open and the deadline for bidding is Saturday, April 28 starting at 10:00 A.M.
PAYMENT: Shipping – If you are having an item shipped we accept payment in the form of credit cards up to $1,000. Any amounts above $1,000 will require a bank wire transfer for the full amount of purchase. SHIPPING: Bidders may arrange shipping / moving with the company of their choosing. All items must be paid for in full and Buyer must sign a release form and credit card receipt prior to items being released to shipper. Once items are released by the winning bidder to a third party, such as a shipping or moving company, Accelerated Auction Solutions, LLC and Amy Martin Auctions assumes no liability. PLEASE NOTE: There is no correlation between the price paid for an item and the cost to ship. We recommend you get quotes for shipping prior to bidding. The following are 2 local shippers other bidders have recommended.